I really enjoyed trying Skin MD Natural shielding lotion, so when I was given the opportunity to try a similar product that retails for less, I jumped at the chance. 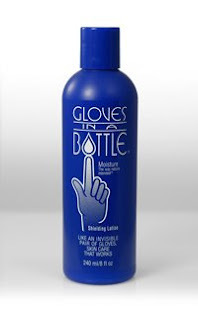 Gloves in a Bottle is a more widely-available lotion that also promises to utilize your body's own natural hydration to retain moisture. Either one you choose will be a good thing for your skin. My horrible cracked heels (that didn't exist before my second pregnancy, grrr) were gone within a couple of uses of both brands and are now moderately sandal-ready. Now I just need a pedicure and we're good to go. Do they make one of those in a bottle? I want to try this too! Actually I won some about a year ago and I use it on my face. I feel like it has helped my problem skin, where "problem" means "likely to get a lot of zits".